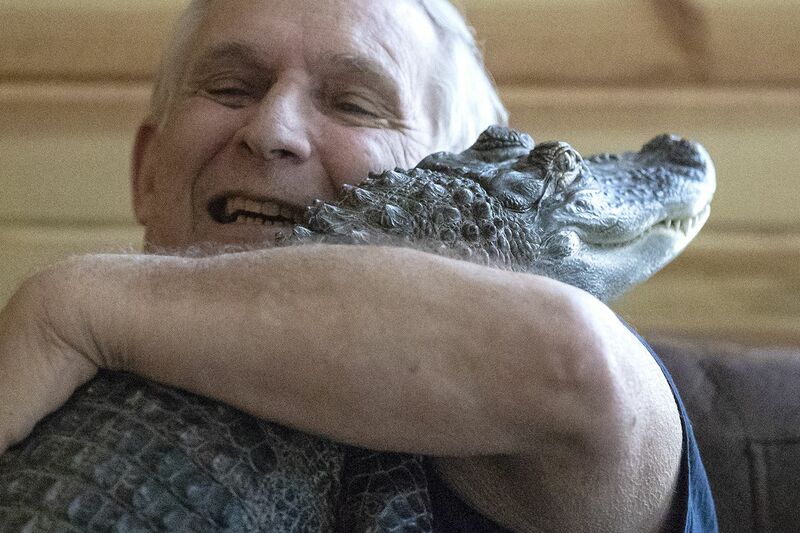 Joie Henney, 65, hugs his emotional support alligator, Wally, inside his home in York Haven, Pa.
YORK HAVEN, Pa. — Wally is bashful, a big teddy bear who likes to snuggle and give hugs, an animal so at peace that he befriends the little goldfish and bullfrogs he’s supposed to eat. Joie Henney, 65, sits with his emotional support alligator, Wally. Wally is Henney’s registered emotional support animal -- like a golden retriever, but cold-blooded. His story is the latest, and perhaps most extreme, in the growing world of ESAs, which are often approved by doctors and granted access to restaurants, businesses, and even airplanes. Although an emotional support peacock was banned from a flight last year. Last week, the Inquirer and Daily News reported that more college students are bringing ESAs into dormitories. A man who answered an e-mail from a reporter about Wally from the website Service Dog Registration of America said, "Our therapist would never approve a client to have an alligator as an emotional support animal. " Henney grew up on a farm nearby in Dover, York County, nursing injured owls back to flight. He was in the Marine Corps and rode bulls in the rodeo and broke wooden boards in half as a skilled martial artist. He made a living in construction and, later, hosted a hunting and television show locally. The three men who died within days of each other were all weaved into those decades, he said. Somehow, Wally filled the void, the camaraderie he lost. One day, he came and slept with him when he was sick. Christopher Young, 19, who lives with Joie Henney and his mother, Liz Caswell, takes Scrappy the alligator out of his 300-gallon pond inside their York Haven home. Wally, who will be 4 in July, was rescued from just outside Orlando when he was 14 months old. Henney said Wally could grow anywhere from 14 to 16 feet long and weigh 900 to 1,100 pounds. Wally eats chicken wings and shares a 300-gallon plastic pond, indoors, with Scrappy, a smaller, younger alligator the family has also rescued. Wally’s favorite programs to watch on television, of course, are Gator Boys and Swamp People. He also likes to watch The Lion King. Alligators are undeniably dangerous. Florida, home to 1.3 million alligators, has tallied 410 unprovoked bites and 25 fatalities between 1948 and 2018. In one infamous case, a young boy was snatched and drowned by an alligator while on vacation at Disney World. That boy, Henney pointed out, was not eaten. Wally, Henney cautioned, is still a wild animal, one that could tear his arm off now, and do worse later. But he doesn’t think that will happen. Wally has appeared at senior centers and minor-league baseball games in York. He’s got a meet-and-greet at York’s Central Market next month. Joie Henney's emotional support alligator, Wally, rummages through the pantry inside his York County home.